Hey, all you lovers of coffee get in here and see what's brewing, and please make sure you are smiling when you check in or else...lol. All the way from Berlin Germany, this coffee machine serves you based on your mood, so if you smile, it brews you coffee. If you frown, it brews you stronger coffee. The connected coffee machine I saw at Intel's booth here at IFA isn't a consumer product yet, but it very well could be. I love the idea. Using Intel's RealSense camera, facial recognition, a laptop, and a little "Internet of things" building block from a company called DigitalStrom, the setup can cache various people's faces, learn how they like their coffee, and brew it to fit. Intel has been pushing RealSense at this show, trying to point out ways that its 3D depth-camera technology is actually useful. The company also demoed 3D scanning using a RealSense-equipped all-in-one PC, as well as a solution for airlines which uses a RealSense camera to measure your carry-on luggage to make sure it'll fit. All of these things are a heck of a lot more useful than the applications we saw on the first RealSense tablet, the Dell Venue 8 7000, which were mostly restricted to putting gimmicky filters on your photos. The DigitalStrom blocks also look intriguing. They look like Lego blocks, and they hook up to anything with an on-off switch, turning simple appliances into connected gadgets. There's already a block to hook up to your coffee machine—it costs $125—but it looks like the block could only trigger brewing. 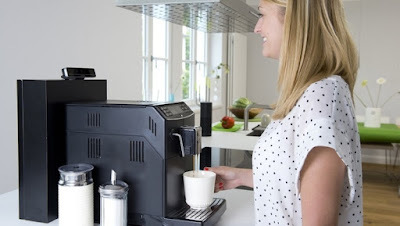 It would need to be integrated more closely into the machine to trigger different brews. © frankwealth.com. Awesome Inc. theme. Powered by Blogger.